The Lobby 7 dome is going to receive enhancements and repairs, and has been cordoned off for pedestrian safety during construction activities. The work will include replacing the existing glass block and adding a new secondary skylight, similar to what was done to the Building 10 dome exterior last semester. 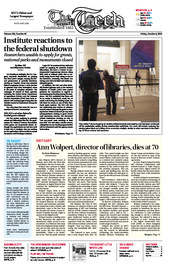 Ann Wolpert, MIT’s director of libraries since 1996, has died after a brief illness. She was 70 years old. UNITED NATIONS — Countries all over the world, dictatorships and democracies alike, have in the past few years sought to tame — or plug entirely — that real-time fire hose of public opinion known as Twitter.